makes performances and artistic work; applies the arts and communication for positive change; provides the development and cultural sectors with best practice in applied arts. 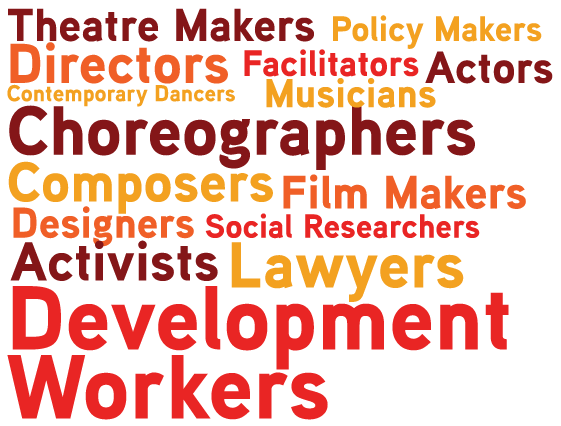 Arts for Action is a global network of practitioners drawn from across the performing arts, media and development sectors. It's #worldtheatreday! We'd like to take you back to our production H28. This piece was made in response to the murder of Ugandan LGBT activist #DavidKato and the following 2014 anti-homosexuality bill . Here are some beautiful shots from the performance. We've been hard at work with out new ensemble - Here are a few snaps from our first workshops. There is still time to apply for our Lead Social Researcher role as part of our Just Acts programme with Rohingya refugees in Bangladesh! The role will involve working on socio-legal research into informal access to justice for Rohingya refugees, working with partners IOM, BBC Media, and Translators Without Borders. Get your tickets for opening night on the 14th! "As we inevitably fall into darkness, it is in the human spirit to embark on a journey to get back to light." Want to see what we are into? "Don't Worry, Humans Can't Live Without Light"
Few more tickets available!! Get yours ;)! Beautiful work as ever from David Glass . We are delighted that our lead ensemble member Francois Testory will be taking a workshop for LIMF this weekend with David Glass ! Opportunity alert! Please share! Arts for Action islooking for a Social Research Leader for a socio-legal project in Bangladesh. The first phase of the programme is funded by IOM, and partners include BBC Media Action, Translators Without Borders, Unite Theatre for Social Action (UTSA), the Governance and Justice Group, BNWLA, ASK, BLAST and others.